You know that game you keep coming back to, no matter how much you've played it already? Thanks to a new data storage technology called 5D, you'll be able to store it on a tiny piece of nanostructured glass and load it up again a long, long time from now. Say, 13.8 billion years. Researchers at the University of Southampton have developed the technique, which involves femtosecond (that's a quadrillionth of a second) laser writing. The file is written in three layers of dots separated by five microns (one millionth of a meter). "Coined as the ‘Superman memory crystal’, as the glass memory has been compared to the 'memory crystals' used in the Superman films, the data is recorded via self-assembled nanostructures created in fused quartz. The information encoding is realised in five dimensions: the size and orientation in addition to the three dimensional position of these nanostructures." A pocketful of these discs could archive every PC game ever made, although we expect getting a R/W drive for your PC might be a tad expensive 50 years from now. 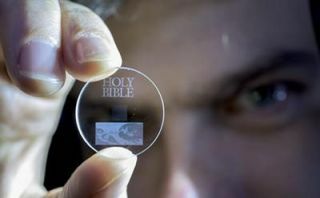 So far, the likes of the Universal Declaration of Human Rights, the Magna Carta and the King James Bible are in 5D storage, so it's probably only a matter of time before you can get Minecraft on a little glass disc.